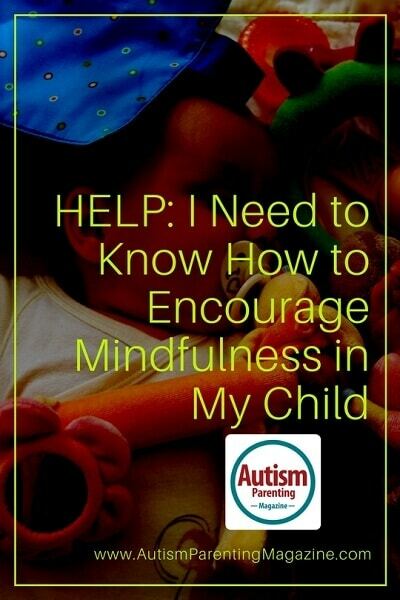 How can I encourage mindfulness in my autistic son? 1. Create a calm zone: This can be an entire room, or even just a small section in the corner of a room. Maybe it’s even a neat closet space underneath the stairwell. However big or small, make a space that’s sole purpose is to be a safe, quiet area where your son can go. Make it simple yet inviting; nothing too bright or busy. Include items that involve his senses such as a soft blanket or pillow. 2. Schedule body checks: set a routine to prompt your child to regularly check in on himself. This may help with avoiding a meltdown by catching the signs of stress early on. For example: before he leaves for school, or when his toy breaks, have your child stop and think about his body. Depending on the age and ability level of your child you can ask him the questions, have a visual, or just work his way down the body. This is referred to as a body scan. “How does your head feel?” “How does your chest feel?” “What’s happening in your tummy?” “How are your legs?” By checking in on himself, part by part, he will be in tune with his body and how he’s feeling. 3. Perform breathing exercises: find a CD, MP3, or even a YouTube of a guided breathing activity. Do this with your child so you can model it for him if he needs a reminder sometimes when the audio clip isn’t available. Have him focus on breathing in and out, slowly. You can even modify your language to things like “fill up your tummy with air,” “big breath in, hold a bubble!”, “let the air bubble out nice and slow so it doesn’t fly away” Make it fun but calming. 4. Post an emotions chart: by having a visual available your son can check the chart and let you know which one he’s feeling. This also serves as a reminder to check in on how he feels each time he sees the chart. Again, depending on his age and ability you can choose a simple chart with the 4 basic emotions (happy, sad, mad, scared) or you can do a more complex one that includes emotions like nervous, frustrated, exhausted, etc. 5. Utilize a visual cue system: Use pictures, hand signals, or even written words to help remind your child to slow down, check himself, breathe, and/or be present. This may be things like a stoplight where you can change it from yellow (slow down) to red (stop), a stop sign, pointing to your eyes to signal him to look around, or writing “breathe” on a notecard. However you cue your son, the purpose is to gently remind him to stop what he’s doing and get in tune with his body and his surroundings. Remember that you should practice what you preach. Modeling mindfulness will help your son incorporate these strategies more easily. Get the whole family involved! I hope these tips help. Angelina M. works as a Board Certified Behavior Analyst, specializing in assessing and treating children and adolescents with autism, down-syndrome, and other developmental delays. She began her career in Applied Behavior Analysis in 2006, following her youngest brother’s autism diagnosis, and has since worked with dozens of children and families. She also writes a blog about her experiences as both a professional and a big sister. Her brother, Dylan, remains her most powerful inspiration for helping others who face similar challenges.